We use state- of-the-art Brush and Vacuum System that cleans and removes debris at the point of contact. 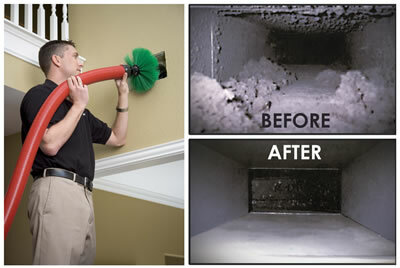 Plus, with our video system we know the duct work is clean! Our service uses specialized tools to dislodge dirt and other debris in ducts, and then vacuum them out with a high-powered vacuum cleaning system.We filter all the air with a heap filtration system. Call Schuh’s Cleaning Services for a quote and breathe easier again. It could be the healthiest home improvement investment you will ever make.